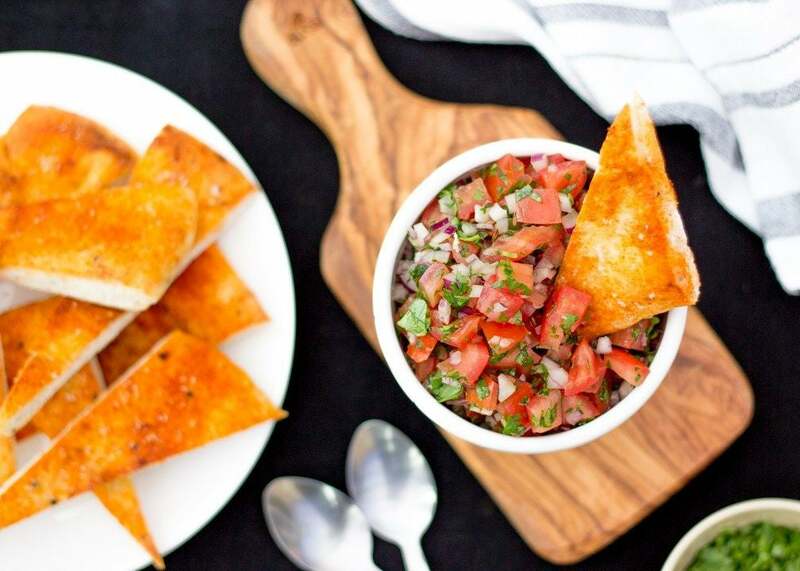 50 ways to celebrate national chip and dip day. Seasoned with za’atar and spicy harissa, this roasted veggie dip is a perfect indulgence. Cheddar and cranberry sauce make for quite the pair in this spicy concoction of pumpkin puree and beer. Sweet onions caramelized in porter with thyme and chives are paired with a decadent brie and mascarpone blend in this rich dish. Hot spinach dip is at its best when served in toasted, hollowed out rolls and topped with a handful of shredded Swiss cheese. Wine and cheese in form of a dip? Sign.us.up. This gluten-free skillet dip has all the makings of a flavorful and mouthwatering treat. Dijon mustard, thick Virginia ham, and layers of creamy cheesy goodness complete this sandwich-turned-dip. A cheese and dijon mustard blend with spicy pimento peppers, plus a bacon and scallion garnish. We just found the perfect side for those crispy, fried potato chips. This yogurt-based dip is light and healthy! Take your famous guacamole to the next level with the sweet addition of grilled pineapples! Fresh tomatoes are key in this simple mix loaded with flavor and spice. This rich blend may border on the consistency of a soup, but there’s no denying its spot on our Super Bowl spread. Elevate the classic artichoke and spinach dip with white beans, mozzarella, and fragrant sprigs of rosemary. Roasted pumpkin is paired with a bold 5-spice mix in this hearty yet healthy blend. Chips, veggies, fried chicken, you name it! We can think of countless things to dip in this versatile and light blend. The bonus? It only takes five minutes to make! Your classic game day fare plus a healthy garnish of tomatoes and olives. This jumbo lump crab and pepper jack cheese mix is spicy, rich, and garnished with a splash of citrus. We wouldn’t call this a guilt-free dip, but pair it with sliced apples, it’s not that bad. Plus, we’re sure the little ones will definitely approve. A crockpot dip means little work for major goodness. We have an inkling that this two-cheese and chili mix will be quite the hit. You can’t consider your spread complete without a classic. A campfire favorite turned game day treat. (And you won’t smell like a campfire afterward). This baked, seven layer dip features a delectable combination of creamy jalapeno artichokes, salsa, black beans, mini sweet bell peppers, shredded cheese, and more! A creamy, spicy, and cheesy mix with savory hints of bacon and a herb garnish. This roasted red pepper dip features surprising notes of mint and a spicy walnut crunch. With a creamy texture and a handful of crisp greens, this cheesy blend is a must for the app table. An original take on a rich crab dip featuring a light yogurt base and generous dash of Old Bay Seasoning. Toss this savory dipping sauce with spicy Thai noodles or serve with a side of crunchy veggies. An inspired blend of kalamata olives, tomatoes, and artichokes, seasoned with garlic and topped with a toasted feta crumble. A roasted combo of tomatillos and peppers lend a kick of spice to this too-easy salsa mix. Two classics team up in this hearty, slow cooker blend featuring spicy chili and macaroni and cheese! A vegan and gluten free bowl of queso may seem too good to be true, but this eggplant and almond milk blend comes dangerously close to the real thing. Black beans and raspberry chipotle sauce are the stars of this creamy, cheesy blend. This 5-ingredient chocolate brownie dip is entirely effortless and a must for the dessert table. An everything bagel meets a healthy spinach dip, in this surprisingly delicious sunflower seed and chickpea blend. With a garlic and scallion saute, this creamy recipe is pure dipping perfection. Spicy Italian sausage, a trio of cheeses, and fire roasted tomatoes come together in this layered lasagna dip bake. A Philadelphia mainstay in dip form features layers of shredded chicken, green onions, and cheese. This sweet and savory blend is guilt-free snacking at its best, plus it takes mere minutes to make! With a skim milk base and a bundle of spices, this light version of queso won’t disappoint. It will however, disappear. Pair this sour cream-based dipping sauce with a plate full of fried green tomatoes. Onions, anchovies, mushrooms, and Worcestershire sauce lend an irresistible touch to this creamy dip. It’s back to the basics with this slightly creamier take on guacamole. Hints of citrus balance out the overpowering flavors of dijon and parmesan, in this light and refreshing dip. A crunchy, creamy mix with thick layers of chiles, cheddar, beans, and more! A clever blend with added crunch gives the typical onion dip a whole new meaning. Slow cooked onions with thyme and wine are bound to make quite an impression in this caramelized delight. A party staple featuring a smokey revamp with a slew of fresh flavors and spice. Layered dip and the Super Bowl are besties, and have been for quite awhile. Don’t be shocked if it’s gone by halftime! A refreshing combo that’s easy to make and full of light and colorful flavors. Top this delectable blend with a blue cheese and pistachio crumble, and serve with a side of fresh veggies and crackers. Loaded with herbs, red pepper, and cheese, this refined mix is game-day elegance–and yes, that exists.